Chuckle if you will, but these speed machines are serious! The Bed Race is open to anyone who wants to get in on the fun and excitement of old fashioned bed racing. FREE! 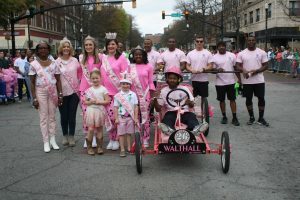 If you would like to enter to race in the 2019 Bed Race click HERE. Come out and see if you can beat our reigning champs….the Macon Bibb Fire Department!